Why are loan sharks (aka predatory payday lenders) donating money to our Delegate, Michael Webert? Whose interest is he looking out for? Ours or theirs? Here’s one of Delegate Webert’s top donors, Advance America, being satirized by HBO’s John Oliver. Advance America is a company whose best practices somehow include agreeing to an $18.75 million settlement in North Carolina, after they were accused of illegally high interest rates. But they’re just one of the two largest companies in the business. The other company is Cash America. Ok, so how do they practice their best practices? Cash America was ordered to pay $19 million in refunds and fines late last year for illegally overcharging service members and for destroying documents. Say what you like about that, illegally overcharging service members is a ballsy business practice. They must have been the ones driving around with those bumper stickers that say “Extort Our Troops”. But settlements like those are actually something of a rarity and that brings up to why the payday loan industry is seemingly unstoppable: the are incredibly good at avoiding regulation. They are incredibly good at avoiding regulation. And who hates government regulation? Our Delegate, Michael Webert. In 2018, he took money from not ONE, not TWO, but THREE payday lenders. AND he took PAC money from the Dominion Leadership Trust. This PAC is significant because payday lenders and other businesses run their donations through this PAC to hide their names on campaign finance reports. Why does he need this money? As our Delegate, he should be advocating for us, his constituents. What do Advance America Cash Advance, Check Into Cash VA and Community Choice Financial expect for their money? One word – INFLUENCE. This is just one example. He’s taken money from all kinds of businesses. Del. Webert recently voted NO on a bill to ban tobacco and vaping in school. Was his NO vote because he believes students should vape in school? Or did Altria, formerly Philip Morris, aka Big Tobacco get their money’s worth? They are also one of his top donors. Campaign finance is a big problem in Virginia. That’s why I’ve pledged to take NO corporate PAC money. I want you to trust that the only person I’ll advocate for in Richmond is YOU. 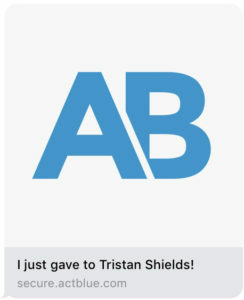 I’m Tristan Shields. I’m a Rural Democrat running for Delegate in 2019. 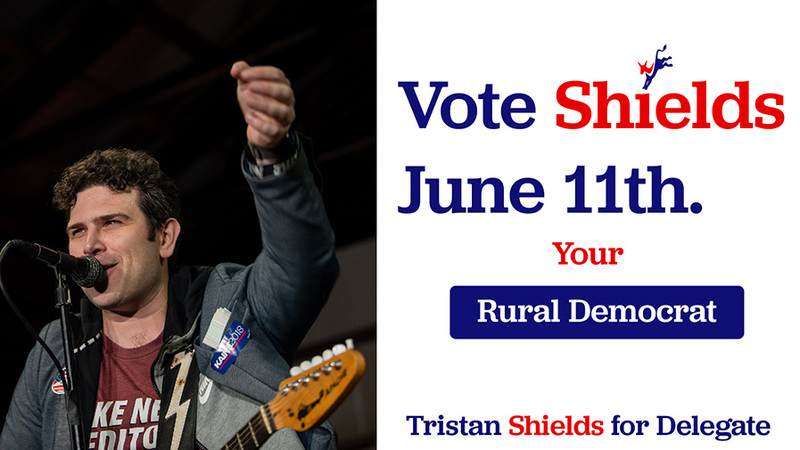 You can VOTE for me in the Primary on June 11th.